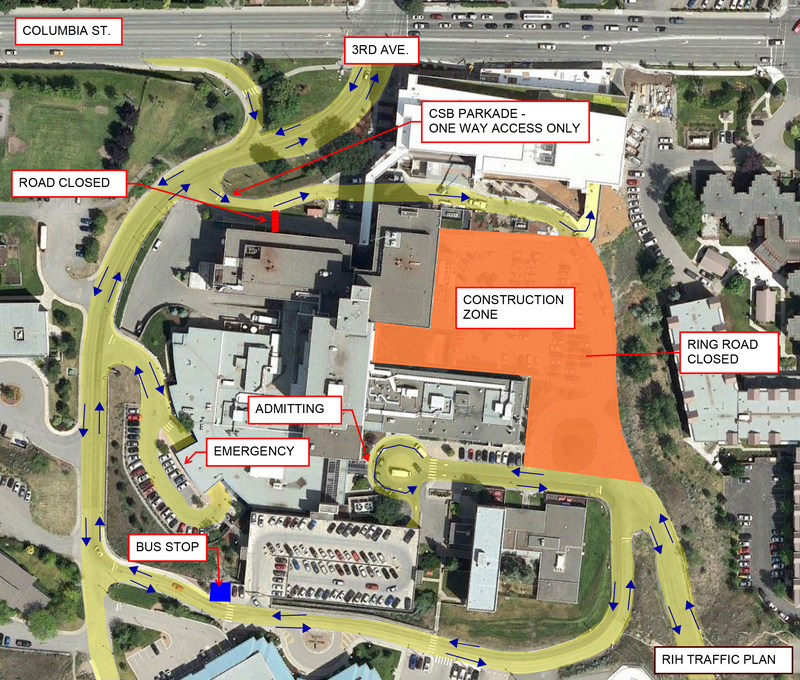 KAMLOOPS — Interior Health would like to advise residents of the Kamloops region that there will be access changes taking place at Royal Inland Hospital (RIH) this week and next due to construction of the RIH Patient Care Tower project. As of Wednesday Oct. 10, the east portion of the hospital campus’s ring road will be closed for the duration of the construction project. Visitors and patients accessing RIH will still be able to use the northern portion of the road to access the Clinical Services Building parkade, however through traffic on the ring road will be closed. On Tuesday, Oct. 16 the breezeway at the north entrance to RIH as well as the bus drop-off along the CSB building will be closed to vehicle traffic. Traffic coming into the RIH campus will be directed to use Third Avenue and the remaining portion of the ring road for access to the site. These areas will be closed for the duration of the Patient Care Tower project. Flaggers will be on-site to help direct traffic and signage will also be posted in key locations. Access to the emergency entrance at RIH remains unchanged and the bus stop is being relocated to a location directly across from the Hillside Centre at the entrance to the staff parkade. Interior Health is committed to promoting healthy lifestyles and providing a wide range of quality health-care services to more than 740,000 people living across B.C.’s vast interior. For more information, visit www.interiorhealth.ca, follow us on Twitter @Interior_Health, or like us on Facebook at www.facebook.com/InteriorHealth.